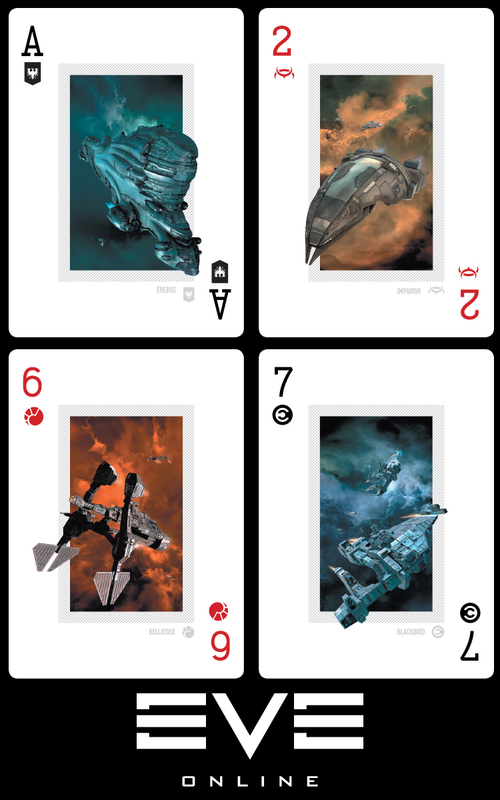 Eve poker decks feature stunning art on every card depicting different classes of ships. Each suit features ships from one of the four main Eve races. Cards are printed on DriveThruCards' best quality cardstock, a 305gsm, blackcore stock made in France. Cards are printed and shipped from the US. Price includes only the deck itself, we recommend that you add a deckbox to your purchase for an extra 99 cents. Cards come in a variety of styles. You can see them all here. In addition to a variety of card back images, you can select card faces that come with traditional suits (clubs, hearts, spades and diamonds) or if you want maximum Eve-awesome, select card faces with Eve race insignias as the suit indicators.